Want to make your stay in Paris even more magical? Try a cruise on the Seine followed by a spectacular show at the Moulin Rouge. It'll be a night you'll never forget! You'll start the evening with a scenic river cruise down the Seine River. Just sit back and relax while Paris' beautiful buildings and monuments, illuminated against the night's sky, pass you by. 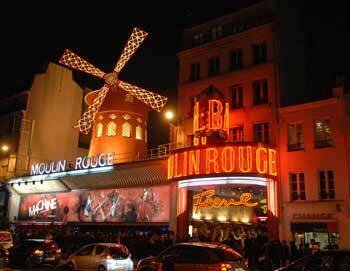 After the cruise your bus driver will take you to the amazing Moulin Rouge for a show like no other! Féerie is a spectacular two hour show filled with feathers, rhinestones, glitter, lavish settings, acrobats, original music - and of course the famous French cancan dancers! Shortly after your booking is complete your e-ticket will be send directly to your email address entered at time of booking, just print it out and bring it with you on your tour. Please plan on arriving 5-20 minutes before your tour starts. The tour ends back at the PARISCityVISION office. You will be asked for your hotel information on the bus, and if it is in the center of Paris, the bus may stop close to your hotel, so you can get off there. The tour runs 5-6 hours. Is there a dress code at the Moulin Rouge? Yes, the dress code is casual and business casual. Tie, suits or dresses are optional. Jeans, shorts, and sneakers are not permitted. The Moulin Rouge is not suitable for children and children under 6 years old are not allowed. 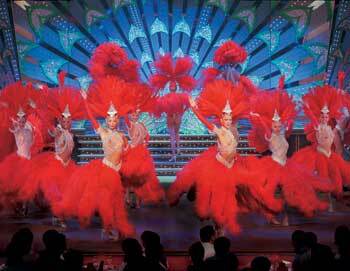 - Moulin Rouge is very popular, and can often sell out months ahead on Fridays and Saturdays. The sooner you book the better the chances are that you will get tickets. If you can visit the Moulin Rouge on a weekday, you will improve your chance of getting tickets. - The Moulin Rouge often operates at full capacity and it can feel crowded.